You’ve wondered about this, I know you have. Me too. In a world filled with mass shootings, natural disasters and entire populations who are displaced, it’s an evergreen question. I am often asked to recommend good resources for discipleship. 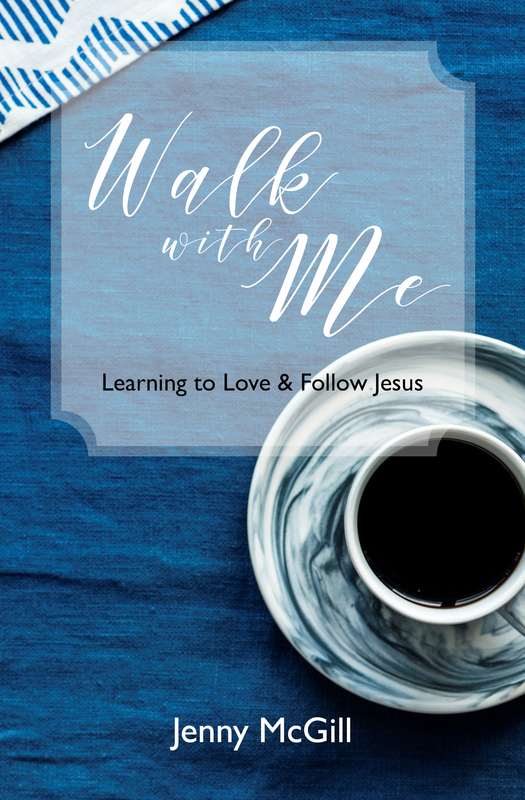 This summer I was delighted to discover Jenny McGill’s new book Walk With Me: Learning to Love and Follow Jesus. Jenny thoughtfully guides us through the basic beliefs Christians hold and what it’s like to live as a Christian as well as the spiritual habits Christians develop. I so appreciate the accessible format that makes it easy to take a new believer (or yourself!) through the essentials of our faith. I’ve invited Jenny to my online home today to share her thoughts on the toughest subject of all: the problem of pain. Welcome! “It’s important in answering this question to consider what explanations other religions offer. How would atheists respond? Is our heartache in life random and a process of natural selection? Is our suffering a result of our desires, according to Buddhism? This may be the harder question to answer. People from other religions address why evil and suffering pervade the world, but do they explain this: how does good exist? From where did it come? Who are we? Why do we deserve good necessarily? But back to the original question. Why do bad things happen to good people? Perhaps another question to ask is, “Why do people experience pain, suffering, grief, death, and injustice?” The triune God answers this through the whole of Scripture. Part of the answer is this: we—we—rebelled against God’s order. Against God. I get stuck on imagining our audacity to do such a thing, and each of us still do it every single day (James 1:13–15; 3:14–16). For example, some choice comes to you, whether to lie on this application, or withhold something from someone illegitimately, or to entertain a certain thought. Someone or something prompts us to stop and reconsider. Then we proceed to intentionally do what we know is wrong. That is how bad things happen…to people who do bad things. Another part of the answer is this: some angels rebelled against God’s order, chief among them, Satan (Revelation 12:7–13). So other spiritual forces of evil are lurking to lure us into traps that we willingly and/or unwittingly walk (Ephesians 6:10–17). Rebellion has caused a chaotic, cosmic war here, fantastic and incredible. God, in fact, went to great lengths to give us an answer, even if we do not grasp it fully. Go to YouTube, look up “Ravi Zacharias,” and watch a couple of his clips (For example, https://www.youtube.com/watch?v=it7mhQ8fEq0). Ravi Zacharias grew up in India, converted to Christianity, and immigrated to Canada and then the U.S. He shares compelling explanations to this question. Nabeel Qureshi, who converted from Islam, also describes his first story of suffering (https://www.youtube.com/watch?v=psrvQZj68h4). Remember, only God is intrinsically good (Mark 10:18; Luke 18:19) and can be trusted, even as we struggle to find answers. You can purchase Jenny’s new book here https://amzn.to/2z4Kco4 and contact her at https://www.jennymcgill.com and Twitter @drjennymcgill. Thank you so much, Maggie. That sure is a big question many people Christians and non Christians ask. I have never heard of that author. Now I do want to read her book. Thank you for reading and commenting, dear Pat! Appreciate you so much. Our oldest son’s first baby was stillborn. My daughter was 14 at the time. She sobbed in my arms,”Why did God let this happen?” I had no answer, I just wept with her. In the coming years they had a healthy baby girl, my daughter in law was diagnosed with a very serious glioblastoma brain tumor and given less than a year to live. God gave her 3 and a half years. But during that time she had another stillborn baby boy. At 28 my son had buried 2 sons and his wife of 27. The Lord never gave me any answers from His Word. He gave great comfort along with the assurance of His presence no matter what might come. I read Job multiple times and concluded that in this broken world, God trusts some of His children with incredibly hard, painful times. He trusts us to keep on trusting His goodness. Perhaps someday He will reveal His purposes, but when we see our Savior face to face, it really will be worth it all. Thank you Maggie and Jenny for this very thought provoking post. Oh dear Polly, what your family has been through…I had no idea! I may ask your permission sometime to share the thoughts you’ve expressed above. You are so right that one day it will be worth it all, as all our questions will be resolved in the light of his presence. Thank you Maggie for inviting Jenny to your online home. I so appreciate her thoughts.